"My dad took night classes to learn English and wrote this as an assignment. 17 years later, I got my Masters. I did it, pa. Thank you." "I want to be able to help her do the homework and show her that the only way to make her dreams come true is through education." That is what Gaby Alfaro's father had written in a notebook 17 years ago when he first started learning English. Gabby graduated from the University of California in 2016 and has recently completed her Masters in Education and Teaching. According to Buzzfeed, she has also been hired as a teacher in the San Bernardino school district, something that has been her goal since she was a little girl. 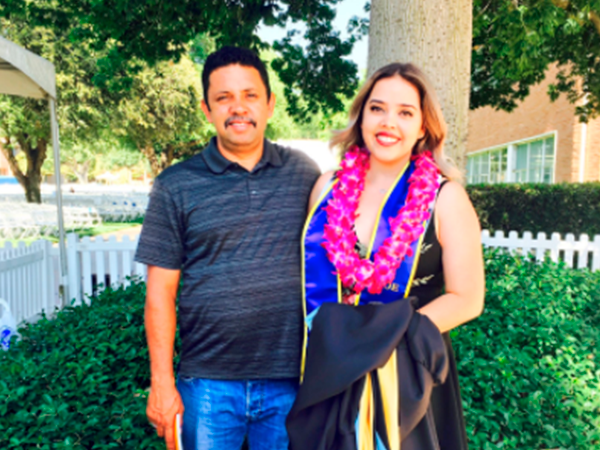 When Gabby's parents were in their 20s, Carlos, her father, worked in landscaping and took night classes in order to learn English. Gabby's mother was cleaning out the house a few months ago when she found some of Carlos' old notebooks from when he was studying. "She showed my sisters and I, and we bawled our eyes out," Gabby told BuzzFeed News. "It is amazing to see how fast some kids can learn the things we teach them. I have a daughter who just turn 6 years old, my wife and I used to read her books since she was 2 years old, now that she is in kindergarten, her teacher said that it's hard to believe how good she can read and spell. "The teacher thinks that she reads as good as a third grade kid. My daughter enjoys reading, we try to buy her lots of books, sometimes we go to the library where she can read as much as she wants, also we check out up to 20 books for her to read at home. "That's one of the reasons why I decided to go back to school. I want to be able to help her do the homework and show her that the only way to make her dreams come true is through education." Gabby said that her father is usually very 'macho' and doesn't show his feelings much, which made his letter even more surprising and touching. Her father didn't know that she had found the notebook or even that she shared it on social media. "I wanted to show him how his hard work has paid off," Gabby said. "When it started getting popular my mom called my dad at work to tell him he was getting famous, I'm sure he'll be a little embarrassed." Are you my knight in shining armour ? I'm a 67 year old woman looking to meet men between the ages of 50 and 90.